The unit s data storage capabilities provide ultimate flexibility. Transfer your data quickly and easily, store your test results for future reference and generate a wide range of FTTH reports. Moreover, the PPM-350C allows you to store up to 1000 test results, which are downloadable through its USB interface. The PPM-350C acts as a pass-through device, allowing the simultaneous measurement and display of all PON signals voice, data and video. This patented, built-in technology facilitates service activation testing and troubleshooting. Whether for identifying breaks, bends, faulty connectors or splices, as well as other causes of signal loss, the PPM-350C s optional visual fiber locator (VFL) enables quick and easy troubleshooting. This valuable option helps you shorten time-to-restoration cycles and increase the productivity of your field crews. 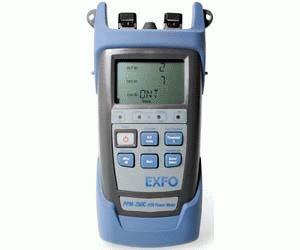 In addition to user-defined thresholds, EXFO s new PON power meter offers pass/warning/fail LED indicators that allow you to clearly and quickly assess your network s power level. This user-friendly feature facilitates QoS verification. The computer interface allows easy customization of OLT, ONT and location names. Start testing right away; don t waste time naming the files. This time-saving feature eliminates the risk of errors. Each file is named correctly so you don t have to worry about having to rename each file when you are back at the office. The PPM-350C features a Job Editor mode, which allows you to pre-configure upcoming jobs in the unit s memory. Once on location, you simply have to select the job ID, the ONT number and the location ID for quick data storage making the need to carry your work schedule in the field a thing of the past.